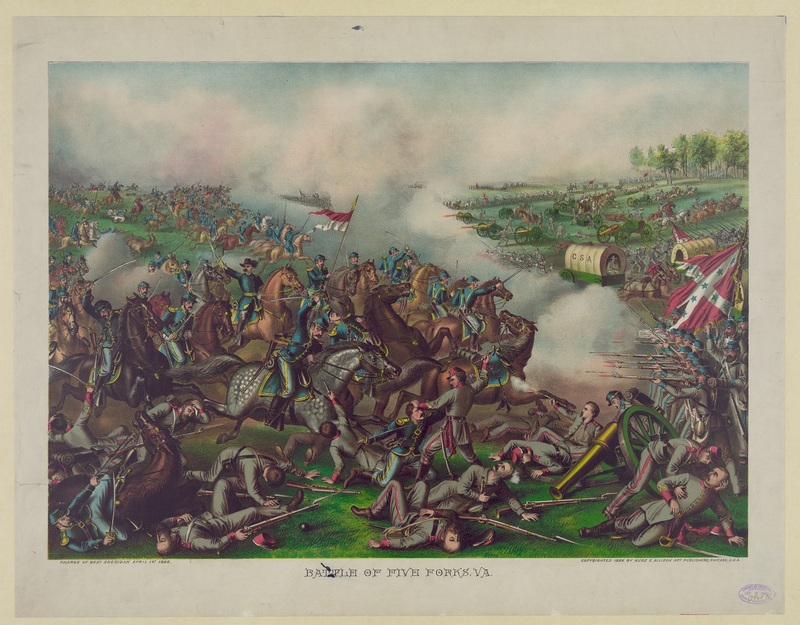 A print depicts Sheridan’s attack at Five Forks. Click to enlarge (Library of Congress). 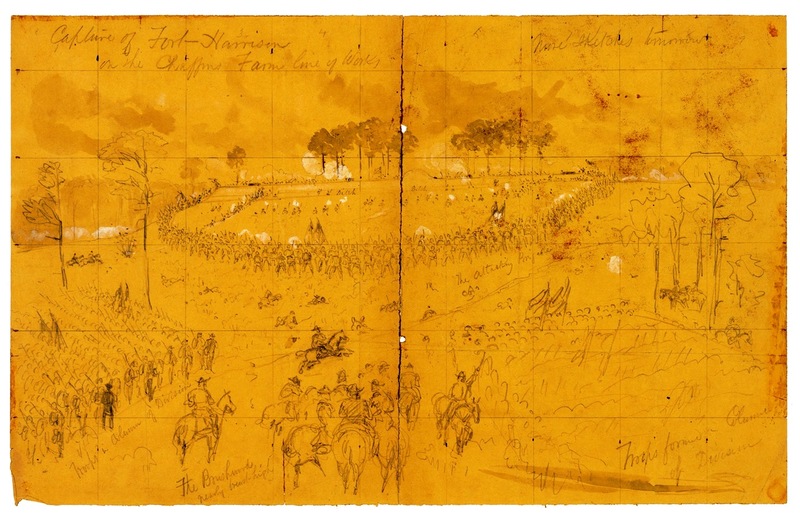 Grant had ordered a movement to get around Lee’s right, with Sheridan’s cavalry moving to Dinwiddie Court House, south of Five Forks, and operating in conjunction with the V Corps. Sheridan and Warren didn’t get along, apparently ever since Warren had complained about Sheridan’s cavalry blocking his way en route to Spotsylvania Court House the previous spring. The relationship did not improve after one of Warren’s divisions had to extricate Little Phil from difficulties with George Pickett’s Confederates at Dinwiddie Court House on March 31. Sheridan did not like to admit he needed help from anyone, much less a cautious Army of the Potomac engineer like Warren. Admittedly, Warren possessed a natural talent for irritating generals. Meade had reached the end of his patience with his onetime protégé. 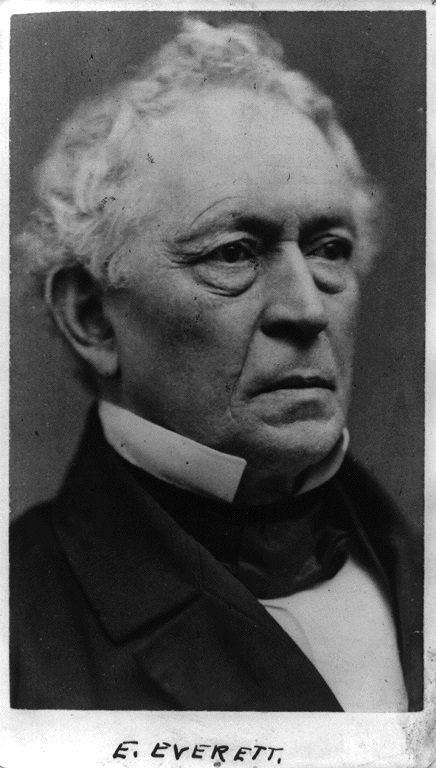 Grant, too, had tired of Warren’s quirks and, like Meade, had discovered a “defect” in Warren’s character: “He could see every danger at a glance before he had encountered it. 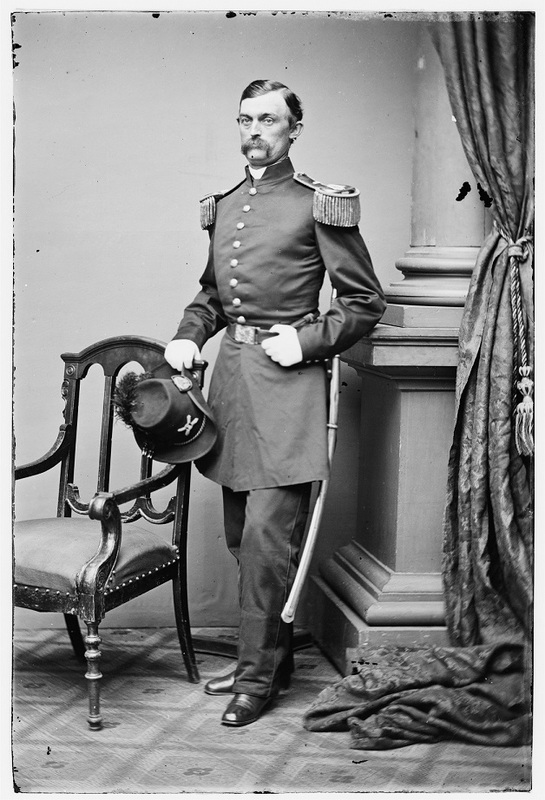 He would not only make preparations to meet the danger which might occur, but he would inform his commanding officer what others should do while he was executing his move.” Grant told Sheridan he was free to relieve Warren and replace him if he felt it was necessary, thus sowing the seeds for Warren’s downfall. 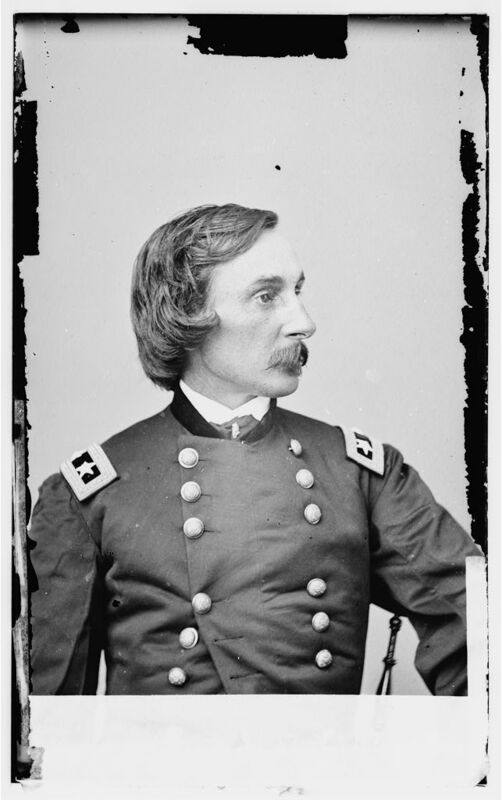 Sheridan wanted to attack the Confederate lines around Five Forks at noon on April 1. He fumed and fretted when Warren wasn’t ready until 4:00. . . . Warren finally put his three divisions into motion, heading north toward the White Oak Road, but Sheridan had misinformed him about the enemy’s position. Two divisions veered left to correct their advance, but Samuel Crawford’s men kept marching straight ahead and missed the Confederate lines altogether. Warren rode off to find Crawford and get him back on track. The Battle of Five Forks marked the beginning of the end for Lee’s army—it was “the Waterloo of the Confederacy.” The rebels had suffered a severe blow. Now that the Union army could move forward and sever the South Side Railroad, Petersburg and Richmond were doomed. Warren and the V Corps had delivered the blow that ensured the victory. 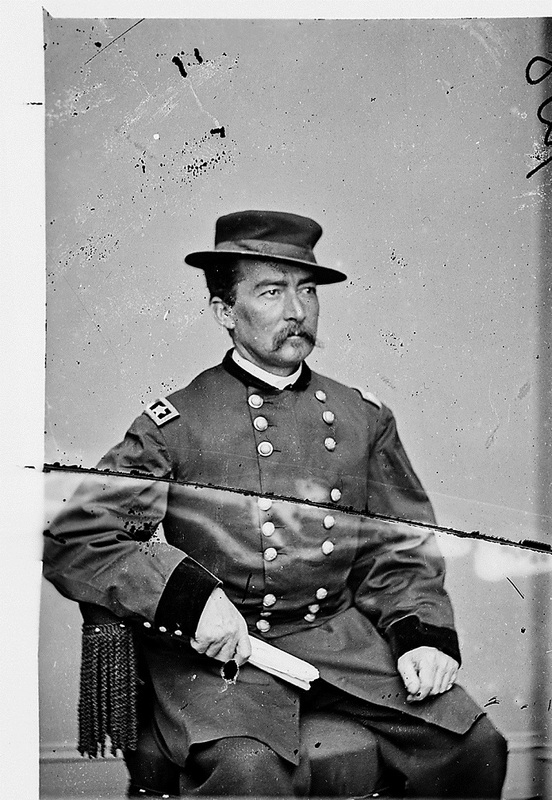 Yet Sheridan, still livid over what he perceived as Warren’s inexcusable slowness–and probably unwilling to share any credit for the victory—decided that Warren had not participated in the fighting at all. He ordered Charles Griffin to take over the V Corps and sent a note to Warren relieving him of command. The word of Warren’s relief hit his subordinates like a thunderbolt. “I was astonished at this news and could not imagine what the trouble was,” said Charles Wainwright. “The only thing that occurred to me was that Warren might have got into one of his ugly fits and said what he ought not to.” Wainwright used his journal to vent about Warren’s ill temper, but he didn’t agree with Sheridan’s decision. “To me his removal at this time, and after the victory had been won, appears wrong and very cruel,” he wrote. We have been moving and fighting the last three days, and I have not gone to bed till after one and two in the morning, and then up at five. We have had considerable fighting with the enemy out of his works, into which we have invariably driven him; but when there he is too strong for us, and the farther we go round to our left, we still find a formidable entrenched line. I think, however, we will this time reach the Southside Railroad, and if we do so, I should not be surprised if Lee evacuated his Petersburg lines and withdrew north of the Appomattox. Should he remain in them, he will have to stretch out so far that we may find a chance to pierce him. Your brother Willie was wounded yesterday, not dangerously, as I telegraphed you. He left this morning, and I sent George to accompany him to City Point, and if necessary to Philadelphia. Jim Biddle arrived yesterday. Now Lyman describes the Battle of Five Forks. You will see the April Fool was on the Rebels; for they did not know that, the night before, we had sent down an entire corps of infantry (the 5th) to aid the worsted Sheridan. Their infantry had contented itself with retiring from Sheridan’s front, half-way to the White Oak road, and going into camp with a precautionary breastwork in their front. As they lay there, resting, Warren struck them in the flank and swung round, even into their rear, while the cavalry charged their front. After a brief but determined resistance, the enemy broke and fled in wild confusion; 4000 and over were captured and a large part of the rest hopelessly scattered in the woods. Thus our movement, which had begun in simple advantage, now grew to brilliant success, and was destined to culminate, within twenty-four hours, in complete victory. We were up pretty early, as usual, and at 6.30 A.m. were already at Grant’s Headquarters. These were close to Dabney’s Mill, now marked only by a huge pile of sawdust — a veteran battle-ground, marked by two considerable actions and many minor skirmishes. Indeed that whole tract is a network of picket-pits and hasty breastworks. After visiting Humphreys, on the Quaker road, we returned to the Lieutenant-General’s, and here it was that a note from Sheridan told that he was driving the enemy. 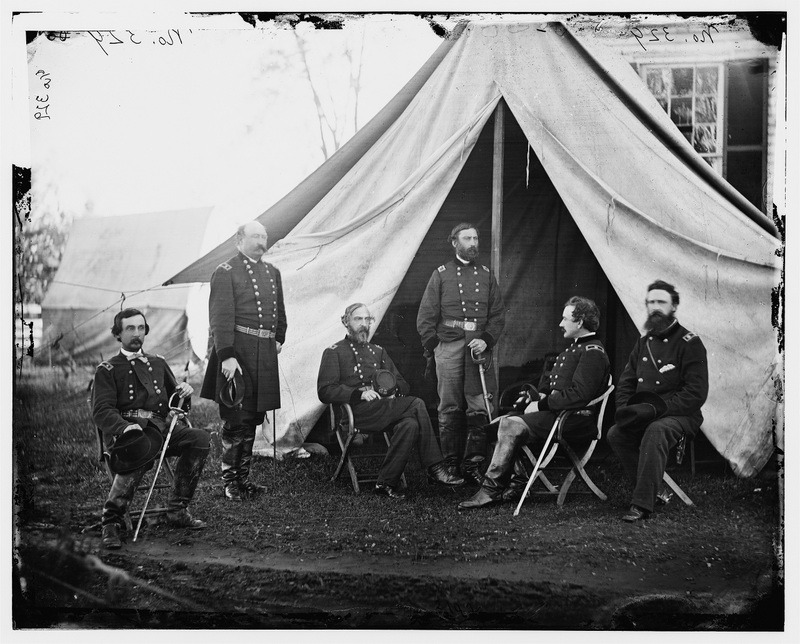 Grant folded the slip of paper, and, looking at Meade, said, very quietly: “Very well, then I want Wright and Parke to assault to-morrow morning at four o’clock.” These dozen words settled the fate of Petersburg and of Richmond! It was midnight when General Warren suddenly came into our camp, followed by only one Staff officer. I got him something to eat, but was surprised to see no look of gratification at his victory to-day. Poor man! he had been relieved from command of his Corps. I don’t know the details, but I have told you of the difficulties he has had with the General, from his tendency to substitute his own judgment for that of his commanding officer. It seems that Grant was much moved against him by this. The General had nothing to do with it. I am sorry, for I like Warren. Meade’s correspondence taken from The Life and Letters of George Gordon Meade, Major-General United States Army, Vol. 2, (New York: Charles Scribner’s Sons, 1913), pp. 268-9. Available via Google Books. Theodore Lyman’s letter is from Meade’s Headquarters, 1863-1865: Letters of Colonel Theodore Lyman from the Wilderness to Appomattox, pp. 332-4. Edited by George R. Agassiz. Boston, Massachusetts Historical Society, 1922. Available via Google Books. “Capture of Fort Harrison on the Chaffins Farm line of Works”by William Waud. Sketched on September 29, 1864 (Library of Congress). Theodore Lyman’ wrote this letter on October 3, but it covers the events of September 29. I thought I’d post it today. The night of my arrival, curiously enough, was the eve of a grand movement. [ “The move now proposed consisted of an advance both on the right and the left flanks. On the right, towards Richmond, taking the north side of the river; on the left towards the Boydton plank road and southside rail. The strategic object was two-fold: first, to effect threatening lodgments as near as possible to these points, gaining whatever we could by the way; and, secondly, to prevent Lee from reinforcing Early.” — Lyman’s Journal. ] I never miss, you see. Rosey [aide-de-camp Frederick Rosencrantz]drew me aside with an air of mystery and told me that the whole army was ordered to be packed and ready at four the next morning, all prepared to march at a moment’s notice. Headquarters contented itself by getting up about half-past five, which was plenty early enough, as turned out. We rode down to General Hancock’s about 9.30. He was camped not far from us, or had been, for now his tents were struck and packed, and there lay the familiar forms of Lieutenant-Colonel Morgan and Major Mitchell, on some boards, trying to make up for their loss of sleep. The cheery Hancock was awake and lively. We here were near the point of the railroad, which excited General Meade’s indignation by its exposure. Now they have partly sunk it and partly built a bank, on the enemy’s side, so that it is covered from fire. Here we got news that Ord and Birney had crossed the James, the first near Dutch Gap, the other near Deep Bottom, and advanced towards Richmond. Birney went up the Newmarket road, took a line of works, and joined Ord, who took a strong line, with a fort, on Chapin’s farm, which is before Chapin’s bluff, which again is opposite Fort Darling. We got sixteen guns, including three of heavy calibre, also some prisoners. General Ord was shot in the thick of the leg, above the knee. There was another line, on the crest beyond, which I do not think we attacked at all. We went down then to the Jones house, where were Parke’s Headquarters, and talked with him. I saw there Charlie Mills, now on his Staff. Finally, at 1.30 we got to Globe Tavern where was the astute Warren. Everything was “set,” as he would say, for an advance by Griffin’s and Ayres’s divisions, while Willcox’s and Potter’s divisions of the 9th Corps were massed at the Gurley house, ready to support. 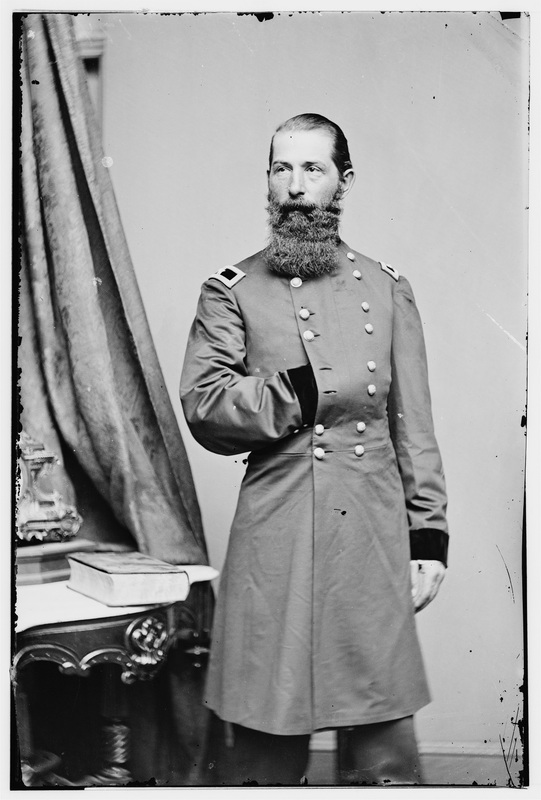 General Gregg made an advance west of Reams’ station, and was heavily attacked about 5 p.m., but repulsed them. Their artillery blew up one of his caissons and we could see the cloud of smoke suddenly rise above the trees. This was all for that day in the way of fighting. Theodore Lyman’s letter is from Meade’s Headquarters, 1863-1865: Letters of Colonel Theodore Lyman from the Wilderness to Appomattox, pp. 232-4. Edited by George R. Agassiz. Boston, Massachusetts Historical Society, 1922. Available via Google Books. Theodore Lyman shows us two sides of General Meade. One is the hot-tempered snapping turtle, the other a man who would give a southern family his lunch and five dollars. 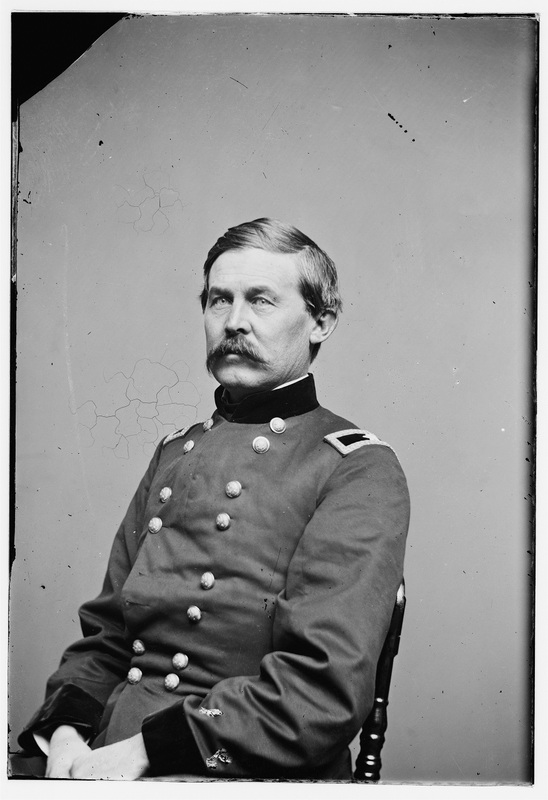 David A. Russell of the VI Corps, photographed when he was the colonel of the 7th Massachusetts (Library of Congress). Last night Russell’s trusty division of the 6th Corps set out on a very long march, as our advanced guard in a flank movement to the Chickahominy. . . . This necessitated our early “getting out of that,” for we were on the bank of the river, and the Rebel skirmishers would be sure to follow right down with the first daylight to the opposite side. Indeed, a little while after we were gone they did come down and fired into the telegraph waggon, wounding the side of the same. By four we had taken our breakfast and were in the saddle. Wonderful how promptly all the servants pack the things and strike the tents when they expect to be shot at! We rode first to Burnside, into whom the General pitched for cutting the march of General Warren and not sending up the brigades to hold the fords; and B. rather proved that he was right and Warren wrong. I can tell you aquafortis is mild to the Major-General commanding when he gets put out; which is quite not at all unfrequently; but I have seen him in no such fits as in the falling back from Culpeper to Centreville. Here he can lean upon Grant more or less, though he does all the work; so much so that Grant’s Staff really do nothing, with the exception of two or three engineer officers. Then we passed by the gushing Hancock, who explained what he was going to do, in his usual flowing style. At Chesterfield Station we found two divisions of the 6th Corps massed, and just then beginning to march out. They were issuing rations, to each man his bit of beef and his “hard tack.” We got ahead of the infantry and kept on the way, sending some cavalry ahead in case of wandering Rebels. The road was strown with dead horses, worn out and shot by the cavalry, when they came this way from their raid. Really whenever I may see civilized parts again, it will seem strange to see no deceased chargers by the roadside. We made a halt to let the column get up, at a poor house by the way. There were a lot of little children who were crying, and the mother too, for that matter — a thin ill-dressed common-looking woman. They said they had been stripped of nearly everything by the cavalry and expected to starve. So the soft-hearted General, who thought of his own small children, gave them his lunch, and five dollars also; for he is a tender-hearted man. We kept on, through a very poor and sandy country, scantily watered; for this was the ridge and there was no water except springs. At 9.30 we dismounted again at an exceptionally good farm, where dwelt one Jeter, . . . who was of a mild and weak-minded turn. He said he was pleased to see such well-dressed gentlemen, and so well-mannered; for that some others, who had been there two days since, had been quite rude and were very dusty; whereby he referred to the cavalry, who, I fear, had helped themselves. . . . About one o’clock, having ridden some twenty-two miles in all, we stopped at the house of one Thompson and, that afternoon, camped near by, just close to Mangohick Church. . . . I discovered to-day that the Lieutenant-General has sick-headaches periodically — one now, for example, for which he put some chloroform on his head. Theodore Lyman’s letter is from Meade’s Headquarters, 1863-1865: Letters of Colonel Theodore Lyman from the Wilderness to Appomattox, pp.128-30. Edited by George R. Agassiz. Boston, Massachusetts Historical Society, 1922. Available via Google Books.